When you walk the old Roman streets of Pompeii, stand on the Great Wall of China or ponder the mysterious altars of Stonehenge, you can't help but marvel at the remarkable capabilities of past civilizations. The nine places highlighted below are familiar from our history books, but nothing compares to seeing them in person. Escorted tours can provide easy access to these wonders. Expert local guides walk you through the sites and share the stories behind their construction. National travel discounter Vacations To Go represents more than 30 tour operators and offers itineraries ranging from budget to luxury. For more information on tours that stop at these destinations, call (800) 680-2858 or visit Vacations To Go. 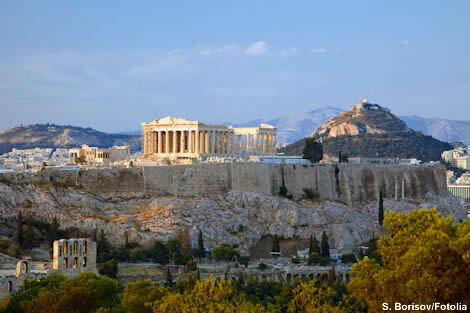 Perched on a rocky plateau, the collection of classical Greek architecture known as the Acropolis is an oasis of antiquity at the edge of modern-day Athens. It's crowned by the goddess Athena's temple, the Parthenon, still a striking sight more than 2,440 years after being completed. Six caryatids -- elegantly draped stone female figures -- support the "Porch of the Maidens" at the Erechtheion, the temple where Athena's snake is said to have lived. The Acropolis Museum preserves artifacts unearthed at the site, dating to Greek, Roman and Byzantine times. Among the exhibits are the finely sculpted friezes that once graced the structures of the "sacred rock." The Colosseum has survived vandalism, earthquakes and a fire, but it remains an iconic symbol of Rome. 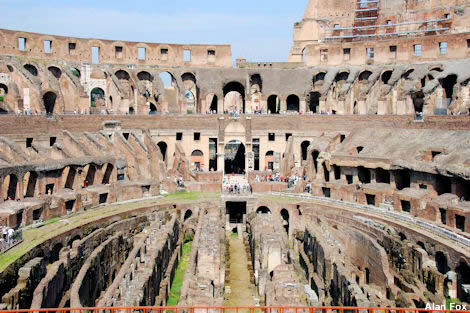 Finished in A.D. 80, the ancient stadium was the largest entertainment venue built by the Romans. It could hold up to 50,000 spectators who entered through 80 street-level arches. Early lineups at the Colosseum included hunts, executions, dramatic productions and gladiator contests. Some recorded accounts claim that the Colosseum's floor was flooded with water to re-create sea battles and show off the skills of swimming horses. Today, visitors can peer down into the exposed underground tunnels that once held animals and slaves. Only a small fraction of Ephesus has been uncovered, and excavations still are taking place at the site in western Turkey. Look in any direction and you'll see scores of broken columns, carved stones piled in the grass, and perhaps a cat sunning on a chunk of marble. As you walk through Ephesus, you can picture the dynamic city that was home to about 250,000 citizens. 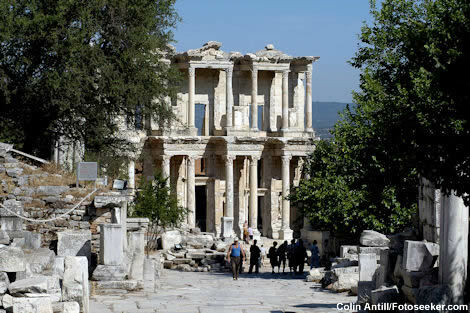 A road paved in marble leads to the Celsus Library (above), impressive for its two-tiered, columned facade. The massive amphitheater could hold 44,000 people. The Temple of Artemis, one of the seven wonders of the ancient world, once stood here. In a mountainous region of southwest Jordan, between the Red Sea and the Dead Sea, the Nabataeans carved Petra out of sandstone cliffs. It became the capital of their powerful kingdom, an important crossroads where economic and social life flourished through the sixth century. Some 800 monuments are located here, according to UNESCO. The most elaborate edifice is the Treasury (above), which is especially striking when first glimpsed at the end of the dark, narrow gorge known as the Siq. 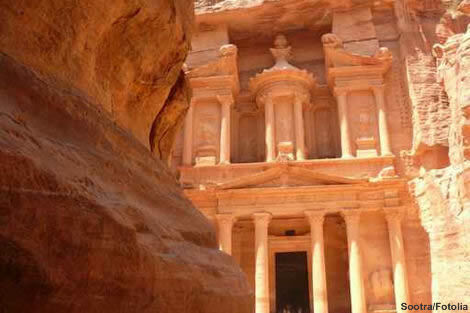 The mile-long Siq is the main entry for Petra, and it makes for a dramatic approach to the "rose-red city." Like a sleeping dragon, the Great Wall snakes across 4,000 miles of China from east to west. The earliest fortifications were erected by feudal states and made of packed earth and gravel. When Emperor Qin Shi Huang unified China in 221 B.C., he ordered the construction of a single defensive barrier that would protect the country from invading foreigners. 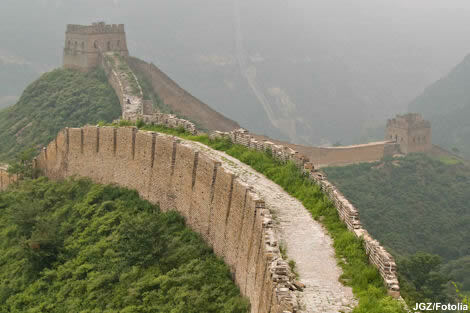 It was the precursor to the Great Wall as it's seen today, much of it repaired, rebuilt and expanded by later dynasties. What remains now was built by the Ming Dynasty of 1368 to 1644. Most tourists walk along the Badaling section, about 50 miles from Beijing. It is the best-preserved stretch of the Great Wall. 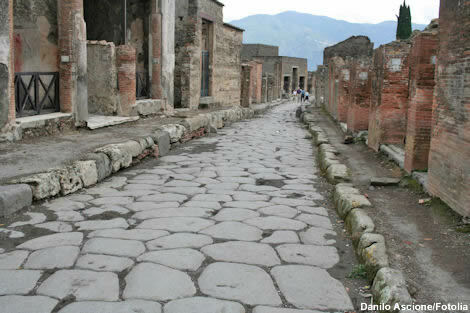 Pompeii was a thriving Roman city until the morning of Aug. 24, A.D. 79, when Mount Vesuvius erupted in a violent fury. Layers of ash and pumice 75 feet deep buried Pompeii, Herculaneum and nearby villages, which helped preserve the site until its discovery in the 18th century. Today, Pompeii is a top attraction in southern Italy, near Naples, and it's the only archaeological destination that offers a true portrayal of life in a Roman city. Visitors can walk along the streets paved in stone, and through the homes, baths and amphitheaters ornamented by frescoes and mosaics, still intact after more than 1,900 years. The three pyramids of Giza rise from the tawny desert outside Cairo, Egypt. 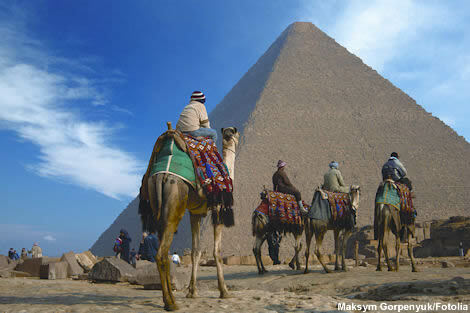 Each pyramid was erected to house the mummified remains of a pharaoh -- Cheops (also called Khufu), Khafre and Menkaura. The Great Pyramid, built for Cheops, is the oldest and the largest. Completed in 2690 B.C., it measures 448 feet tall and has a base that covers 13 acres. Nearby, the lion-bodied Sphinx stands guard. More than 2 million blocks were used in the construction of the pyramids. However, the exact methods used by ancient Egyptians to quarry, move, sculpt and set the stones are unknown. 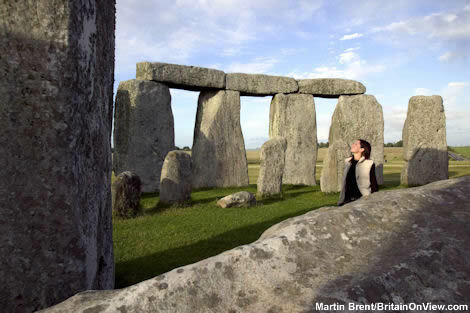 Stonehenge, erected some 5,000 years ago, presents another mystery. The two concentric circles of stones, some fashioned into crude arches, make for an incongruous sight in the pastoral countryside of southern England. Was it a temple to the gods, an ancient astronomical observatory, or some sort of calendar? Walk among the prehistoric hunks of rock and you may develop your own theory. The construction of Stonehenge required a herculean effort. The heaviest slabs weigh 50 tons and would have required the strength of 600 men to move. The smaller inner stones of the circle, called bluestones because they turn blue when wet, traveled more than 240 miles from Wales. Thirty-five years ago, farmers digging a well near the central China town of Xian made a startling discovery: They uncovered a life-size figure of clay. Archaeologists descended on the spot, and their excavations revealed three enormous pits estimated to hold more than 8,000 terra-cotta warriors, and several hundred horses and chariots, too. 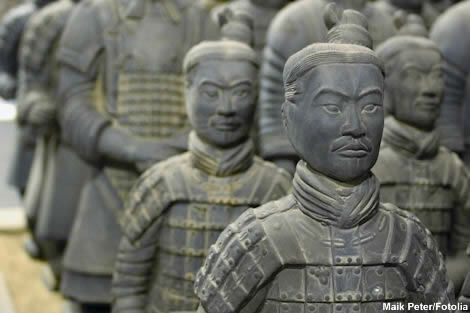 For centuries, this silent army had guarded the tomb of Emperor Qin Shi Huang, who commissioned them at the age of 13; he died, at 50 years old, in 210 B.C. The figures are remarkably lifelike. Arranged according to military rank and duty, each one has a unique facial expression. The information in this story was accurate at the time it was published in January/February 2010. Please visit Vacations To Go or call (800) 680-2858 for current rates and details.